An atheist in California has again sued to remove the words “under God” from the Pledge of Allegiance and “In God We Trust” from all U.S. currency. A student in Vermont is suing her school for refusing to recognize her Christian club. An Illinois high school freshman has challenged her school’s “moment of silence.” And, of course, Christmas 2007 brought another spike in religion-related complaints—protests about public school choirs singing religious songs and demands that Nativity scenes be removed from outside town halls. Religion-based lawsuits like these have continued to multiply in recent years. As this most recent batch of cases works its way through the legal system, however, those involved may find themselves before a Supreme Court that is ready to redefine some of the controversial boundaries between church and state. Big change may be coming in America’s culture wars—a legal shift that could alter the so-called separation between church and state. And a Roman Catholic majority on the United States Supreme Court may be the driving force behind it. In the past 50 years, the nine justices on the U.S. Supreme Court have struggled to solve divisive religious issues brought under the Constitution’s First Amendment guarantee of freedom of religion. The result? A confusing patchwork of legal mumbo jumbo. These cases—often decided by a vote of 5 to 4—have limited how government is permitted to recognize God. Justice Sandra Day O’Connor (a social moderate and the first woman to serve on the court) often wielded that decisive fifth, swing vote on matters of religion. O’Connor is retired now, replaced by Samuel Alito, the fifth Catholic justice on the present Supreme Court. Justice Alito has joined Anthony Kennedy, Antonin Scalia, Clarence Thomas and Chief Justice John Roberts to form the first Catholic majority in the court’s history. Will this change the course of court decisions? These five justices are likely to vote together, but not primarily because they share the Catholic faith. Instead, they share a conservative judicial philosophy that values the role of religion in our nation’s traditions and in its moral foundation. “Congress shall make no law respecting an establishment of religion.” These first 10 words of the First Amendment—known as the establishment clause—were placed in the Constitution by our founding fathers. What do they mean? It is generally agreed that these words mean the federal government cannot set up an official religion, as England had done with the Anglican Church. Nor can the state coerce its citizens through taxation or other laws to support any particular religion. But the conservative justices argue further that our nation was built on faith in a supreme being—a God whom the founders never intended to exclude from public life. The Declaration of Independence says our Creator endowed us with certain inalienable rights, among these are “life, liberty and the pursuit of happiness.” And John Adams, a founder and the second president, noted, “Our Constitution was made only for a moral and religious people. It is wholly inadequate to the government of any other.” To this end, the First Amendment gives religious Americans preferential treatment: in the exercise of their religion, they are specifically protected from government interference. On the other hand, the four more liberal justices on the court view the Constitution as a living document that has evolved from 18th-century thought. In their view, modernity requires a stricter separation between church and state, with very little (or no) government involvement with religion. They fear that some Americans—atheists and those practicing alternative religions—could be treated as second-class citizens. On today’s Supreme Court, Justice Antonin Scalia and Justice Anthony Kennedy stand out, each for a different reason. Justice Scalia is undoubtedly the most outspoken voice on establishment clause issues. He has been a longtime critic of the court’s rulings, arguing for greater tolerance of religion in the public arena. A persuasive advocate, Scalia is often joined in his campaign by Roberts, Thomas and Alito. Justice Kennedy, on the other hand, has a special role to play: he is the new swing vote on establishment clause issues. This means he will usually be the decisive fifth vote that carries the day, one way or the other. 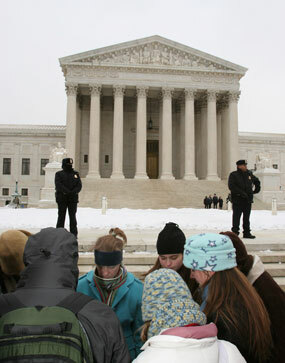 Although Kennedy is generally conservative on matters of religion, he is less so than his fellow Catholics on the court. Kennedy voted to uphold Roe v. Wade, which established abortion as a fundamental right. He also authored the 2003 opinion that for the first time recognized legal protections for homosexual persons. Justice Scalia, on the other hand, voted opposite to Kennedy on both issues. Changes in the area of church-state law will occur only to the extent that Justice Kennedy and his swing vote allow. But we can expect Kennedy to join the other four conservative justices in creating a more practical, commonsense approach to matters of church and state. Most significantly, the court is likely to abandon the controversial “Lemon test,” a point of reference for deciding church-state questions. This complicated three-part test has been widely criticized as both ill-conceived and inconsistently applied. In its place, expect to see a new judicial measuring rod—the “coercion test.” Using this tool, the court will decide whether the state has coerced its citizens to support or participate in any religion or religious exercise. Though key constitutional protections will continue even while the externals change, applying this simpler test may result in striking changes from the current way the court views some issues. Most significant, the new majority may alter the rules governing public displays, especially depictions of the Ten Commandments and Nativity scenes at Christmas. In recent years, monuments with the Ten Commandments inscribed on them have been a flashpoint for litigation when set up on government property. Activist groups have successfully challenged displays of the commandments on courthouse walls and town squares. In 2005, the Supreme Court put out a muddled batch of opinions on this matter, with Justice O’Connor voting to remove the commandments from a courthouse in Kentucky. Now that Justice O’Connor has departed, however, expect to see future decisions going the other way. Justice Kennedy will likely join the other four conservative justices in permitting displays of the Ten Commandments on public grounds. Such displays would be accepted as an acknowledgment of religion’s contribution to American heritage. The court could find that such exhibits do not coerce observers to participate in any particular religion. Would there be any limits on displaying the commandments? Certainly. The court would still prevent them from being used by the government to evangelize. For instance, a state will not be able to use the commandments to advocate conversion to Christianity. But under the “coercion test,” this hypersensitive policy may go the way of the dinosaur. In future cases, the court will decide whether such displays coerce people to participate in religious exercise. The justices could rule that erecting a crèche at Christmas is not coercive—it simply recognizes the importance of the Nativity to a traditional national holiday. So those endless December complaints about religious symbols may now be short-circuited by the Supreme Court. Christ may be permitted back in Christmas—even in the public square or high school choir. Sometimes public schools are unnecessarily concerned about allowing religious student clubs. Principals are afraid of improperly endorsing religion. But this fear is not well founded. In a series of equal rights cases, the court has ruled that both religious and secular groups should have the same access to public facilities. To forbid equal access would be to discriminate simply because of a group’s religious identity. For the same reason, religious organizations are permitted to accept generally available public financial aid. Under the new majority, these rules will be continued and possibly enhanced. For example, the court has already turned back one challenge to President George W. Bush’s faith-based initiatives program, which permits aid to religious groups performing secular work, like helping the homeless. This and similar programs will survive under the coercion test. What does all this mean? In practical terms, the Vermont student whose Christian club was rejected by her high school has a strong chance of prevailing in her case. Outside the school setting, however, the Supreme Court has shown tolerance for nonsectarian prayer by government officials. The court has allowed legislators, for instance, to start their sessions with official prayer, as they have done for centuries. Justice Scalia in particular has noted the longstanding American tradition “to acknowledge and beseech the blessing of God as a people, and not just as individuals.” The new majority will likely continue to permit such prayers by officials, as long as no coercion occurs. But what of the Illinois student’s challenge to her school’s moment of silence? It is unclear whether the court will now allow such in-school periods of reflection. In past cases, Justice Kennedy has voted to strike down laws that bring prayer into public schools. He views school activities as obligatory and subtly coercive because of peer pressure on students to conform. Justice Scalia disagrees, arguing that “speech is not coercive; the listener may do as he likes.” In the end, the fate of moments of silence may depend on whether Justice Kennedy views the policy as sanctioning official prayer in school. One thing is virtually certain: the California atheist’s attempts to strike the words “under God” and “In God We Trust” from American public life will fail. Neither Kennedy nor the other conservative justices seem to think these words are coercive or a form of prayer. Indeed, the court will likely affirm the government’s recognition of our country’s long-held traditions and the role of religion in developing America into a great nation. What will the future bring? One or two liberal justices may retire during the next presidency, specifically Justices Stevens and Ginsburg. But it remains to be seen whether the conservative majority will gain more like-minded members on the court. That will depend on the new president and Senate that emerge from the 2008 elections. Even if the five Catholics stand alone, however, expect some groundbreaking decisions on a host of religious issues over the next few years. In addition to the issues discussed so far, the court may hear challenges to private school voucher programs and to teaching alternatives to the theory of evolution, among other divisive topics. As these cases wind their way through the lower courts, it is only a matter of time before the new conservative majority on the Supreme Court flexes its muscles. From the archives, Charles M. Whelan, S.J., on "The Enduring Problem of Religious Liberty." Read the article here. So, on this analysis, if the Legislature were to pass a resolution declaring Jews to be responsible for all of the wars in the world, and declaring in its resolution that no Jew should be elected President or into any position of public trust in this country, changing the Pledge of Allegiance to "one nation under Christ", and the motto to "In Jesus we Trust", we can expect the Supreme Court to uphold that the First Amendment has not been violated, so long as this is "mere speech" and the government has not made it explicitly illegal to be a Jew. Is this correct? Even before I read this I had heard the supreme court with 5 Roman catolic justices, had delclared the death penalty with the three drugs, constitutional. Immoral but legal. Don't think these 5 RC justices will make a bit of difference. Being Republicn American trups Catholicism any day. These Justices have taken an oath to follow the law. They will with integrity interpret and not seek to create law. They are not legislators but judges. If we want the law -- whether regulatory, statutory, or constitutional -- to change, there is a prescribed and lawful proces to do so. You don't appeal cases to appellate judges or justices to change the law. Clearly with statutes they seek to be faithful to the text, to carrying out the intent of Congress. With the Constitution, they are similarly committed to faithful interpretation. The Constitution by its own terms prescribed the amendment process. That is the legitimate way to change the document to address evolving circumstances. Those seeking to have our Justices change the law to accord with their own personal moral views are asking men of high caliber to do what their own morals prevent them from doing. They are not there to substitute their personal policy preferences for those of others -- whether those others be members of Congress or state legislatures. We live in a nation of laws, not men. This article also appeared in print, under the headline "The Court at a Crossroads," in the April 28, 2008 issue.